Looking for a quick side dish for dinner? This Sweet and Sticky Oven Roasted Eggplant is healthy, gluten-free and cooks in no time. 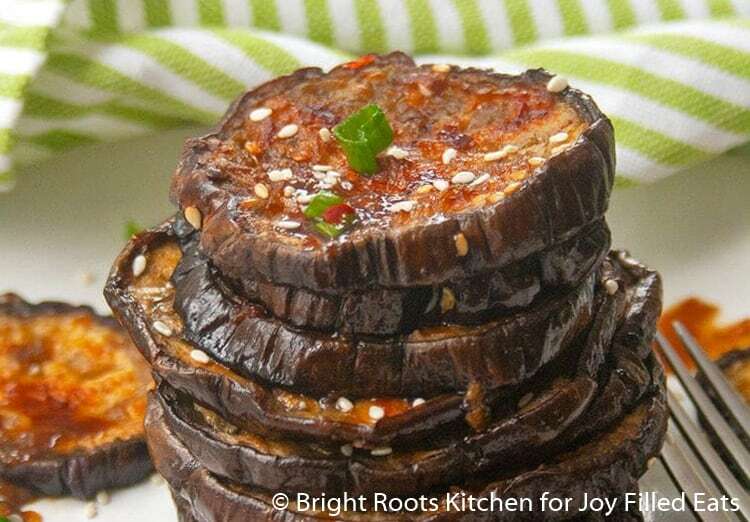 These vegan eggplant “steaks” are roasted in the oven to bring out the natural sweetness of the eggplant. This is a guest post by Ashley from the healthy food blog, Bright Roots Kitchen. To see more of her recipes, head over to the Bright Roots Kitchen blog. I attempted to cook it on various occasions, trying to mimic restaurant dishes. Sometimes it was greasy, other times mushy and sometimes still raw in the middle. So what was the secret to getting the odd purple veggie to cook correctly? Low and behold, the secret is in the prep! Since eggplants are high moisture vegetables like mushrooms, you need to draw that moisture out in order to get crispy, evenly cooked eggplant. Salting the eggplant draws out all of that excess moisture while also seasoning your eggplant. When the excess moisture is removed the eggplant can more easily absorb sauces and marinades. The salting also keeps the eggplant from steaming, which is important for this recipe. 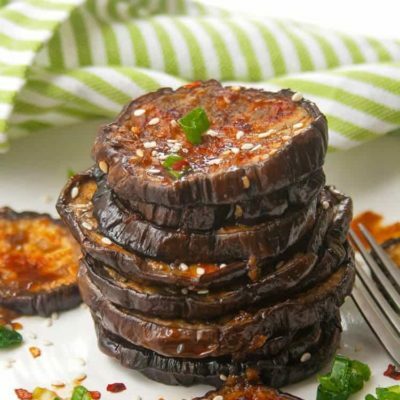 This eggplant is smeared with a garlic soy inspired sauce, so you’re gonna want to have all of the flavors seep into this meal! 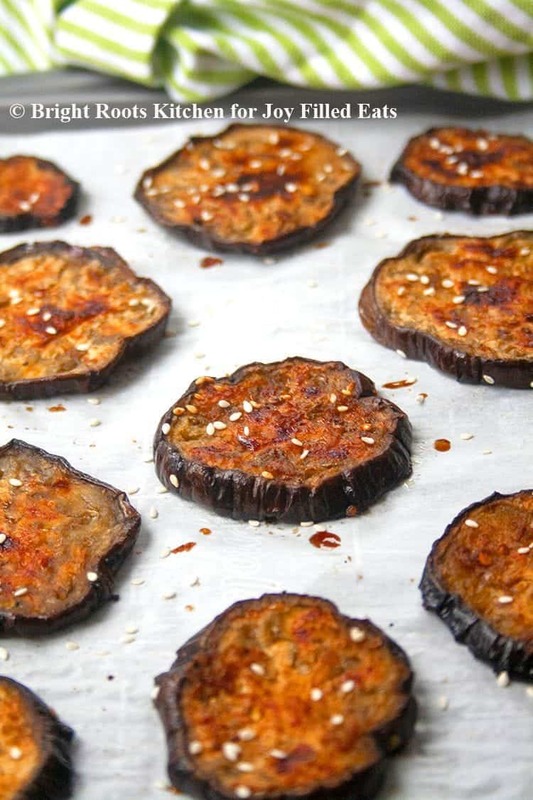 How do you make the sweet and sticky glaze for this oven roasted eggplant? No fancy gadgets needed here. If you have a seal-able jar and 30 seconds you have eggplant glaze. 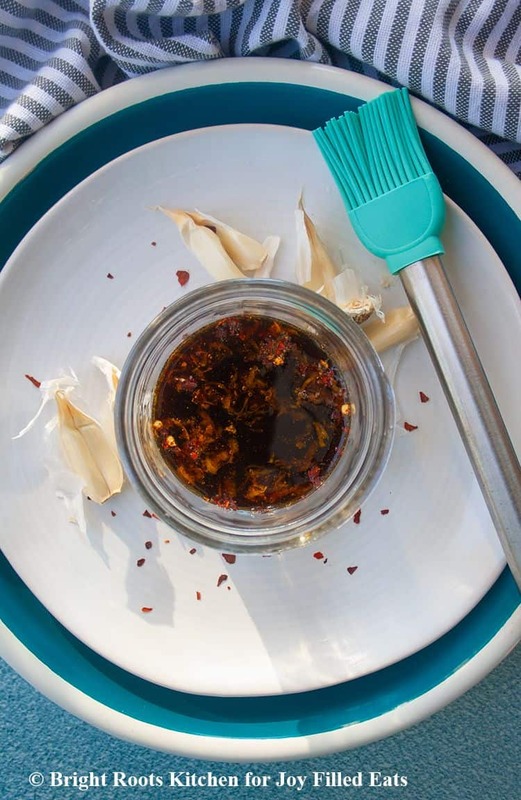 The prominent flavors in this sauce are coconut aminos, garlic, cumin, and sesame oil. All you have to do is put all of the ingredients in a mason jar and shake vigorously until it forms a salad dressing like consistency. What else can you do with the eggplant glaze? The eggplant glaze sauce in this recipe is a spin on a soy garlic sauce. Instead of soy sauce though, I use coconut aminos. If you’ve never used it, it has a soy flavor but it’s sweeter and naturally gluten-free. It’s very versatile and by no means overpowering. How do you know when the eggplant is cooked? When cooking eggplant, you want to look for a balance between tenderness and crispness. It’s very easy to under-cook eggplant, so you’ll want to do a few things when you cook it. If you feel stiffness in the middle it means the eggplant hasn’t roasted long enough and it needs some extra time. What does this oven roasted eggplant go well with? Since this oven roasted eggplant is really flavorful on its own from the marinade, it goes better with a more mild side dish. Like what you see? Follow Joy Filled Eats on Facebook! Love this recipe? Leave a comment & 5-star rating right here! Make sure you don’t miss new recipes by getting email updates! Looking for a quick side dish for dinner? This Sweet and Sticky Oven Roasted Eggplant is healthy, gluten-free and cooks in no time. These vegan eggplant "steaks" are roasted in the oven and go well with your favorite gluten-free grains. Slice the eggplant into even 1/2 inch thick slices. Sprinkle a cookie sheet or cutting board with 1 tsp of salt and then place the eggplant slices on the salted surface. 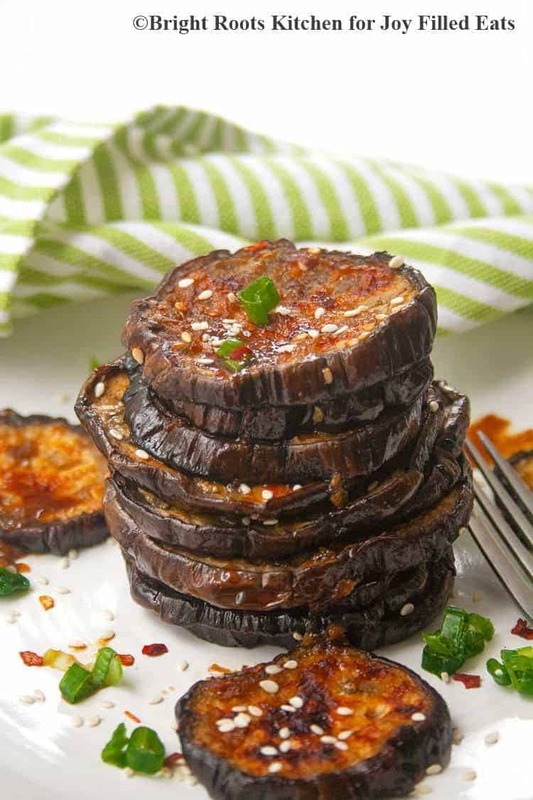 Sprinkle 1 tsp of salt on top of the eggplant slices in an even layer and let them sit for 10-15 minutes. The salt will draw out excess moisture. 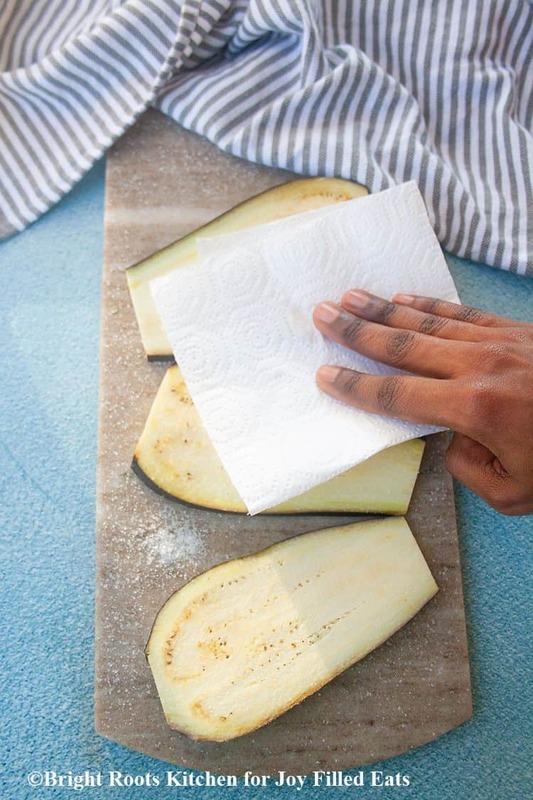 Use a paper towel to pat dry both sides of the eggplant slices and shake off excess salt. 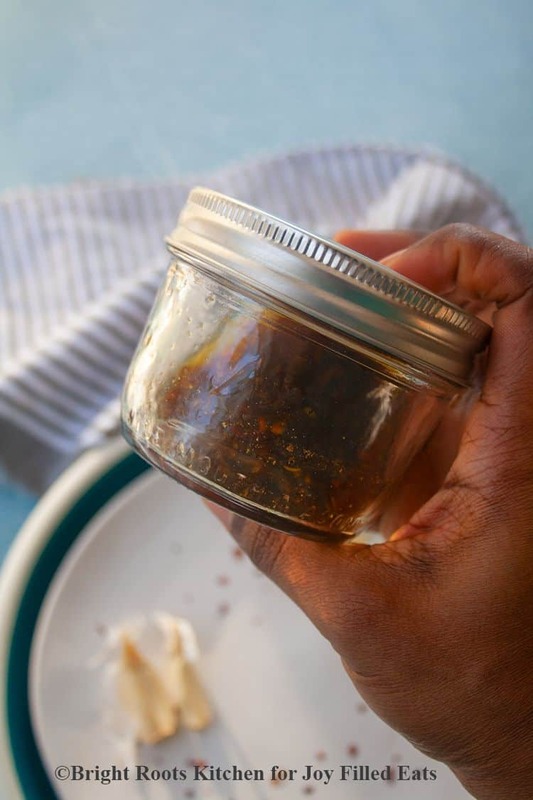 Add all of the glaze ingredients into a sealable jar. Shake for 30 seconds until all ingredients are combined (should be a salad dressing like consistency). Place eggplant slices on a lined baking sheet. Use a pastry brush to brush the glaze on each side of the eggplant. Bake 10 minutes on 400 degrees. Switch the oven to broil, and broil an additional 3-5 minutes on each side until golden brown. Sprinkle with sesame seeds. Enjoy! What great tips for sweating the eggplant! And the sauce sounds amazing! Until now I hated making eggplant. It never came out as anything other than flavorless mush. You've restored my faith in the eggplant with this one! Super tasty and easy to make! Love it!